have just been announced: October 8 - 11, 2015! 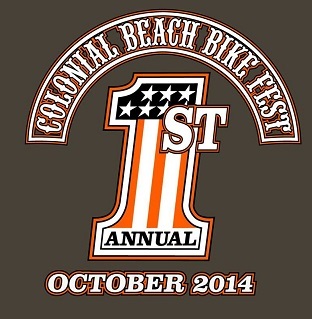 Coming this Fall to Colonial Beach on October 9-12, 2014 is BIKEFEST! This will be the first time that this event takes place here, and plans are underway for it to be an annual gathering, growing in popularity and numbers as the years progress. All American Harley-Davidson are one of the main sponsors. They along with 97.7 The Rocket radio station had discussed the idea, and I'm so glad they did! I can't wait for this event! Web design firm Cyberbility and the Chamber of Commerce are also sponsoring along with High Tides, Wilkerson's, HALO, River Terra Retreat and more. Our area has been and continues to be a favorite destination for bikers, with the beaches, great waterfront dining spots, tiki bars with live music, boating and fishing activities and many lodging options. Visitors can enjoy a fun stay in our historic riverside resort town. Stay tuned to this page for updates. Contests, music, vendor booths and much more are sure to be a part of the weekend's festivities. We'll be sure to keep you posted! In the meantime, book your rooms! Accommodations are sure to fill up fast. We have the River Edge Inn for lodging as well as many other waterfront motels, bed and breakfast inns and rental cottages. There are also campgrounds and cabins available, if you're up for that! The Dragstrip and Hall's Supermarket are opening up space for campers. Boaters can dock up to the many transient slips available at our local marinas. At High Tides: Bar Games every hour, like Lighted Hoopy – Loopy-Hula Hoop as long as possible without dropping. Last person still hooping wins. 11am Event Kickoff at Colonial Beach Dragway 2035 James Monroe Hwy. 11am - 7pm Celebrity Impersonators and a free personal dessert pie at Sher's Snack Shack, 323 1st Street. 1pm “Come Sink The Pearls of High Tides” Dunk Tank! Full Throttle Saloon's Fajita Mike at the Eagles, 517 Colonial Ave.
6:30pm Tattoo Contest (visible art) at High Tides. With tattoo artists Rick Soule, Sam, April, & Josh. $10 entry fee. Prizes include $200 Gift card for Best Overall. 8am Breakfast Sandwiches and Coffee $4 and Bike Show at the Eagles parking lot, 517 Colonial Ave.
Loop Ride Poker Run starts at the Municipal Pier in Colonial Beach (foot of Hawthorn St.) Pre-ride briefing at 9:15am, kick stands up at 9:30am. 10 - 1 Ripley from 97.7 The Rocket live radio show broadcast at Town Hill. 5:30pm Celebrity Impersonator show at Sher's Snack Shack, 323 1st Street. 5pm Broken Angel band at the Eagles, 517 Colonial Ave.
Reno Hill band at the American Legion, 27 Colonial Ave.
8pm Comedy Show at The Riverboat featuring Irwin Loring, Mike Aronin and Timmy Hall $10. Doors at 8pm, show at 9. 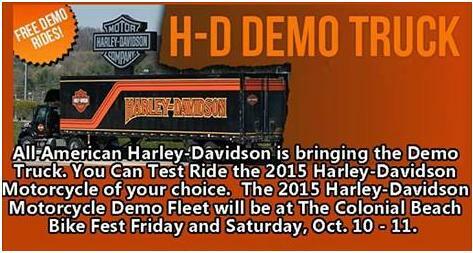 Bike Show sponsored by All American Harley-Davidson and professionally judged by Boston Nichols Bike & Rider Productions. All makes, models, years are welcome. Registration ($20) 10:00 – 12:00, showtimes 12:00-3:00pm. Awards Ceremony at the American Legion's Observation Deck﻿ at 4:00pm. $500 CASH PRIZE FOR “BEST OF SHOW” 25 Classes. 1st, 2nd & 3rd place and five “Best of” Specialty Awards & BEST OF SHOW awards & trophies. For further information or questions, please call Boston Nichols at (804) 761-0765. 11am 9-1-1 Wing Challenge at High Tides “Can you stand the Heat?” Competition to crown King of the Wing! – This event supports the CB Fire Dept. 4pm Bike Show Awards Ceremony at American Legion, 27 Colonial Ave.
Art Exhibit at Jarret Thor Gallery, 100 Taylor St. If you'd like to participate as a vendor, please complete and submit the appropriate form(s), and note that listed pricing is early-bird pricing only. 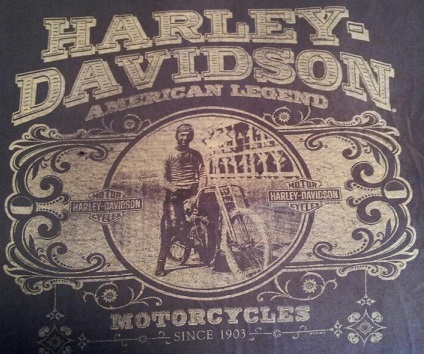 Here's a pic of my favorite Harley-Davidson t-shirt. Picked it up at their store at National Harbor near D.C. The design is by graphic artist Jay Hayden. Update February 2014: A logo with a Halloween twist is introduced. The event does take place in October, after all. Here's King Neptune riding in for the event. 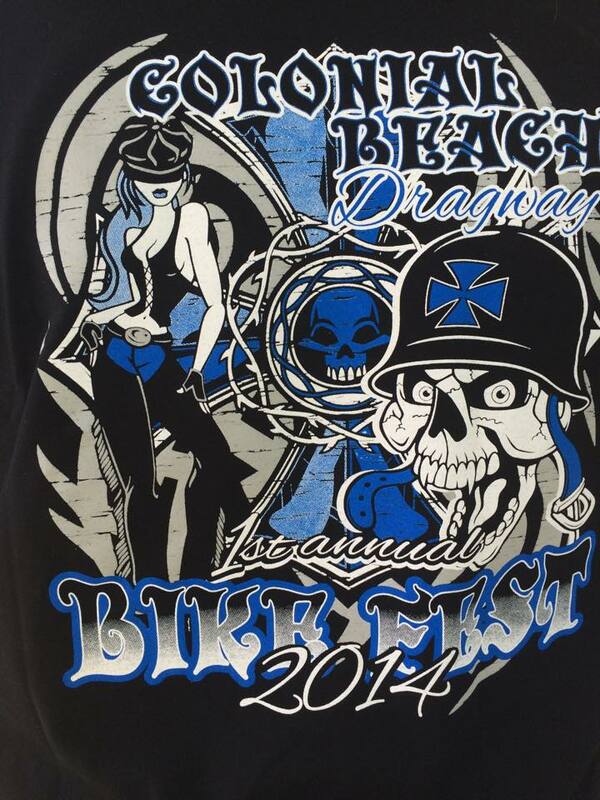 Update January 2014: Bikefest planning meetings continue. Here's a peek at the logo/artwork for the big event coming up in October. 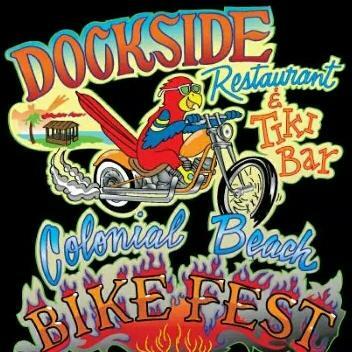 This cool logo (below) shows the tiki bar area of High Tides on the Potomac Steak & Seafood Restaurant in the background.